Most solar pholtovoltaic (PV) power systems use stationary panels. These panels will only yield their highest amount of energy at one point of the day, when the sun passes directly over the panel. A solar tracking system makes the panels follow the sun’s path through the sky. Tracking systems yield significantly more energy than stationary systems. This entry was posted in About Solar Trackers on September 24, 2014 by Brett Houtz. Looking at a solar tracker, and one sees a simple mechanical structure. Probably something anybody could build? Now add to that a requirement for it to operate over a 20 year lifespan, and the picture has quickly changed. Try to think of a electrical/mechanical structure which has operated non-stop, during all types of weather, for the last 20 years. When designing and building a solar tracker, a goal of 20 year operational life must be considered because the additional performance gain can quickly erode with unexpected maintenance costs. Baring lightning or other extreme power surges, the electronics and software will easily last 20 years when designed correctly. The main problems are mechanical, gears, motors and bearings. If you are about to venture out and design a new solar tracker, please give us a call to discuss your options. With our remote managed controllers, we see the day-to-day operational troubles, and have helped many tracker manufacturers improve their designs. There’s no need to retry paths leading to troublesome designs. This entry was posted in About Solar Trackers on September 17, 2014 by mogens. A Local Content Perspective; why Solar Trackers? We often hear solar PV systems promote job growth, but conveniently overlook where the bulk of capital is flowing. Solar PV modules, inverters, and racking systems all consume the lion’s share of a solar system’s capital investment. Adding a solar tracking system, can increase a solar system’s energy yield by as much as 45% or higher, while also benefiting the local economy. Most solar trackers can be designed by local machine or steel fabrication shops – thereby increasing local content. The additional Operational & Maintenance effort, usually reduced to an annual lubrication visit, also increases the local labor component. A Grid Perspective; why Solar Trackers? Despite the continued downward solar PV module price pressure, Solar trackers will remain an important component in tomorrow’s energy systems because of the sustained daily power curve. With stationary solar PV systems, a daily bell shaped power curve is produced with maximum power produced at noon. As a result, a the power grid will have to be engineered to distribute the momentary noon time power production. A poor cost/benefit proposition. 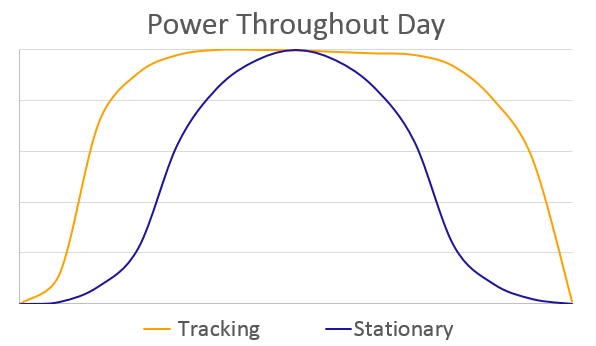 Solar tracking systems will, because of the sustained power curve, provide the grid with a sustained power curve throughout the day. As a result, possibly little to no additional engineering efforts will have to be made to the grid. It is the cost/benefit proposition from the grid’s perspective which will drive the need for future tracking systems, and this is something we will see in the way Power Purchase Agreements are about to be negotiated. This entry was posted in About Solar Trackers, Electric Grid on September 17, 2014 by mogens.